This morning, the Bureau of Labor Statistics released a sobering September report from the Job Openings and Labor Turnover Survey (JOLTS), showing that job openings decreased by 163,000 in September, while downward revisions to earlier data reveal that there were 109,000 fewer job openings in August than previously reported. The total number of job openings in September was 2.9 million, while the total number of unemployed workers was 14.8 million (the latter data are from the Current Population Survey). 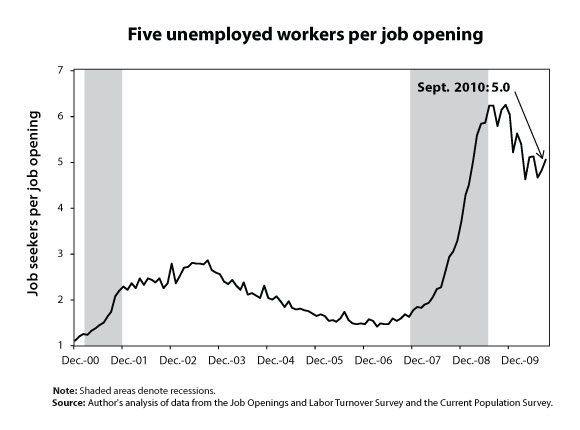 This means that the ratio of unemployed workers to job openings was 5.0-to-1 in September, an increase from the revised August ratio of 4.8-to-1. The job-seekers ratio is displaying a similar trend to other labor market data – substantial improvements from late 2009 to the spring of 2010, and then stalling out what are still crisis levels. September’s value, at 5-to-1, is over three times as high as the first half of 2007, when the ratio averaged 1.5-to-1. It is important to note that the job-seekers ratio does not measure the number of applicants for each job. There may be throngs of applicants for every job posting, since job seekers apply for multiple jobs. Instead, the 5-to-1 ratio means that for every five unemployed workers, there is only one job available — or for every four out of five unemployed workers, there simply are no jobs. Furthermore, when calculating the ratio of job seekers to job openings, if we were to include not just the 14.8 million unemployed workers, but also the 9.5 million “involuntarily part-time” workers (part-time workers who want and are available for a full-time job, and are therefore likely job searching), the ratio would be 8.3-to-1. With so many unemployed workers per available job, it is no surprise that workers who have been laid off continue to get stuck in unemployment for very long periods. In September, 41.7% of this country’s unemployed workers had been unemployed for over six months, the maximum amount of time a worker who has been laid off can receive regular state benefits. On November 30th, the federally funded extended unemployment insurance benefits are set to expire. These benefits provide a lifeline to the unemployed and their families during the deepest and longest downturn since the 1930s, while at the same time boosting spending in the economy and therefore generating jobs. The EPI report A Good Deal for All shows that the continuation of unemployment insurance extensions through 2011 will create or save 723,000 full-time-equivalent jobs. With the labor market currently unable to provide jobs for four out of five unemployed workers, Congress must seize this opportunity.